Prairie Paws Animal Shelter offers cremation services for companion animals such as dogs, cats and other small animals through Pet Cremation Services, a family owned and operated business out of Kansas City, MO. They are a Member of the International Association of Pet Cemeteries. 1) You drop off your beloved deceased companion at Prairie Paws Animal Shelter during business hours. Both private and communal (no ash return) cremation service is offered. 2) During the drop off you indicate if you would like an ash return or if you would like a special urn other than the complimentary one provided. Prairie Paws has a catalog you can reference with a full line of custom personalized urns through Pet Cremation Services. The complimentary wooden urn is shown on the right. A certificate of cremation is provided as well as information on bereavement. Other urns include traditional, photo, and figurine Hardwood urns; Vase and Rock urns; Pewter urns and Bronze urns. They are available in a variety of sizes for all pets including cats & dogs. 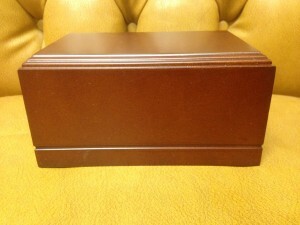 Custom urns are special ordered and available within 7 to 10 business days. 4) You provide payment for the services (check, cash, credit card) and we call Pet Cremation Services and schedule a pick up of your animal and the cremation is conducted at Pet Cremation Services. The urn is returned within 5-7 business days. We give you a call when it arrives on our end to let you know pick up is ready.